While Omron Healthcare is making it big in China, it now is also one of the leaders in the preventive healthcare devices market in India. The overall Indian healthcare industry is expected to reach US$ 280 billion by 2020, according to Deloitte Touche Tohmatsu India. However, preventive healthcare is still at a nascent stage with patients going to the doctor for checks like blood pressure, sugar and nebulizer treatments. But the scope of innovation and making preventive healthcare a bigger space is huge. Omron healthcare is taking up the challenge, bringing unique and convenient devices as well as educating people about the need for such devices. While normal BP monitors are big and are tied to the bicep area, the wrist monitor is compact. It looks like a watch and is tied to the wrist to check BP. However, one needs to make sure that the wrist is placed close to the patient’s heart to get the accurate BP reading. It comes with a cuff wrapping guide, a positioning sensor and an intellisense technology. Unlike regular nebulizers, Omron’s compact nebulizer is small and easy to handle. It also has no noise once the pipe is connected. Extremely light-weighing, this nebulizer makes sure no one around is disturbed while a patient is using it. It is available for a little over Rs 2,000 in the market. This is another very interesting device. It is unlike regular thermometers that are supposed to be placed inside the patient’s mouth. This is an infra-red supported thermometer. It needs to be placed close to the patient’s forehead and it reads the body temperature within one second. Therefore, it’s more hygienic and quicker. Tell us about Omron’s global presence. We are across the globe. Our primary market is India. China is the biggest market for healthcare, we get more than 20 per cent of our revenue from China. But as you know the Chinese economy is slightly unstable. And, that is why we needed to change our strategy. So from this fiscal year, the entire Omron group has put more resources into India, more investment, more manpower here. What do you think about the Indian healthcare sector? It’s huge, especially for hypertension treatments. I read some article that said that one-third of the Indian adult is suffering from hypertension. This is huge. But they are unaware that they have hypertension. So, that is why educating people about preventive healthcare is more of a challenge. What steps is Omron taking to educate people? We’re organising events to tell people about our products, their need and their usage. We also do a lot of road shows. We’re also setting up health check-up camps to increase awareness, and also CMEs. We’re also increasing awareness among doctors so that they can also educate patients. 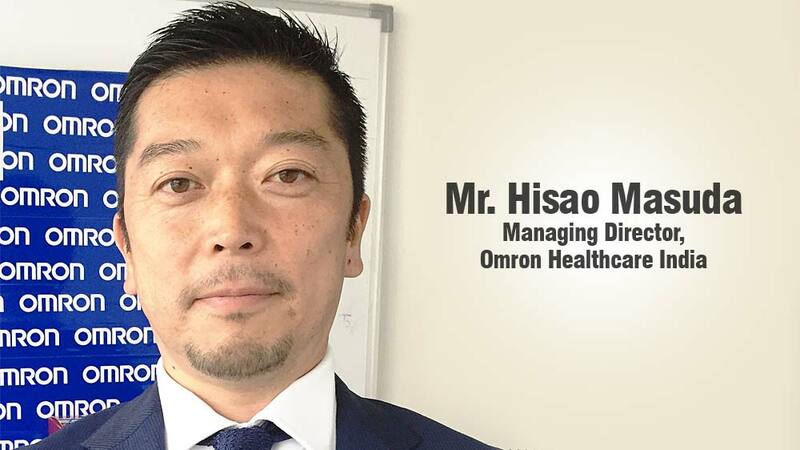 How is Omron changing the Indian healthcare sector? Do you think it is easy to convince the Indian population to actually get these devices at home and not go to a doctor every time? It is a challenge. The products are not so expensive. But today, if a person has Rs 2,000 in hand, they will go shopping or go to a nice restaurant. But now is the time to invest those Rs. 2,000 for purchase of products such as Blood Pressure Monitors. If people invest now, they don’t need to pay later. When did Omron enter the Indian market? We set up the company in 2010, but before hand, we were exporting the products from Singapore since 1997. What growth have you seen in the Indian market? We have grown at a CAGR of 24 per cent in India. Being the leaders in the market, we’ve also understood the importance of educating the market and not just getting what’s in trend. What kind of digital marketing is Omron doing? We have realized the importance of digital marketing today and we are doing a lot of marketing online now. We have realized the need for targeting the younger generations for these healthcare products too, as they are the caregivers. Therefore, e-commerce and digital marketing holds the key for us. What sets Omron apart in the market of other competitive brands like AccuCheck? We cannot compete with AccuCheck. AccuCheck is one of the brands for Gluco-monitor. But they don’t have the range that people need in their daily lives. We at Omron have a range of products, a basket, that a person needs for daily well-being – a BPM, weighing scales, thermometer, nebulizer and blood sugar monitors as well. But my competitors do not have a full range. Secondly, we are not just looking at grabbing the market share, we’re also making efforts to expand the market. So, we’re not just in Delhi, but in Indore as well. Where are you seeing Omron in the next five years in India? We can’t commit on a number for penetration. But, we want to see the penetration at least in double digits. Well-being! We’re about the well-being of you and your family. Looking at 100 studios by 2020: Impulse Studios..